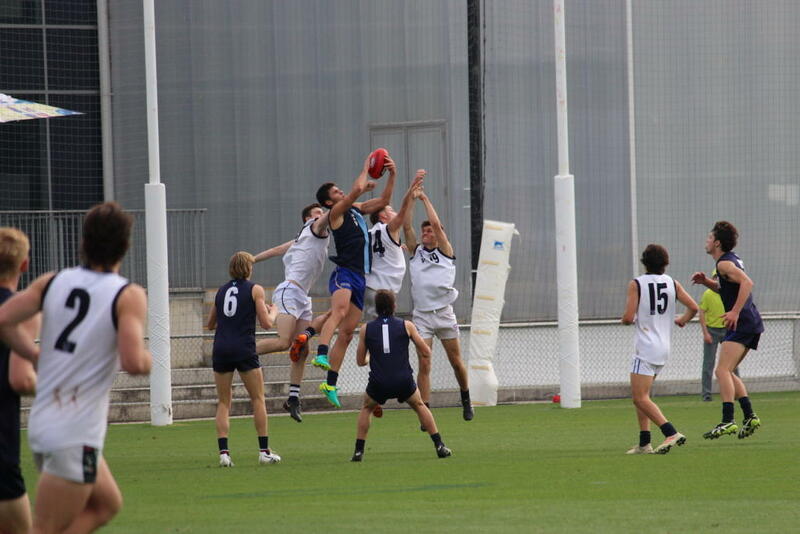 VICTORIA’S top talents in the 2019 and 2020 draft crops took to Ikon Park yesterday with two trial games in front of Victorian selectors and AFL club recruiters in a bid to impress for selection ahead of the National Under 18 Championships. We took a look at 15 of the top performers from both sides across the two games. Ash was a strong performer down back, he rarely missed a target all day and his run and carry throughout the game was a huge factor in the Country team getting the win. Ash showed his dash with some huge runs down the wing, often taking the game on and his constant sideways movement and composure made him a nightmare to tackle for the opposition. Ash often took the kick outs and was extremely organised and often picked the right option and worked hard to again link up. Cahill started the game through the midfield – winning the ball on the inside and outside. He had a nice bit of play in the first quarter winning a contested ball on the wing and then a good handball to is teammate. Cahill would go forward on a few occasions, kicking a nice running goal in the second quarter and a nice pass inside 50 to teammate Josh Smith in the third quarter, he would crumb a contest in the last quarter and showed his dash away from the contests and delivered the ball well by hand. De Koning looked lively early down back, taking the ball at every opportunity and showing some real class with his pickups at ground level – exceptional for a 200cm player. His rebound work was solid and whenever he was around the ball he did some nice things and looked to play with good intent. Dunkley looked best inside the contest using his quick and clean hands at stoppages to release to his running teammates and he did well doing the bulk of the contested work through the midfield. It was not a prolific day stats wise for Dunkley but he would add a nice goal to his name with a long bomb from 50 meters. Flanders was busy through the midfield winning clearances and pumping the ball inside 50. Flanders usually has a big impact up forward so it was good to see him getting some midfield time where he contributed well. He had a nice bit of play in the third quarter, taking a mark inside 50 and quickly kicking to the advantage to teammate Sam Conforti which lead to a goal. Hollands was seriously impressive up forward, he was a constant threat and was often minded by one of 2019’s top prospects Dylan Williams. He kicked his first goal in the first quarter running into open goal and he set up others with his kicking inside 50 all class. One of his standout features was his ability to keep strong in the contest and get his arms up, and his second goal came from a classy snap goal 40 metres out in the third quarter. His best bit of play also came in the third quarter where he worked hard to keep the ball in play on a wing and used the ball well with a long handball to a running teammate inboard. Martin did some really nice things through the midfield, he won some great clearances and showed plenty of class with ball in hand with his best movement coming in the first quarter with a bullet pass inside 50 to teammate Fraser Phillips. Martin was good at stoppages and won some nice clearances. Phillips looked lively early with a nice lead up mark but missing the set shot, he would look bests setting up others with his laser left foot with some impressive kicks inside 50 in the third quarter with one to the smallest player for Country in Jye Chalcraft and tallest, Aaron Gundry. Rantall has had a fantastic start to the year and that trend continued with an impressive showing for Country through the midfield. Rantall’s clean hands and quick handballs at stoppages were a highlight and he was a consistent performer winning plenty of the ball over the four quarters. Rantall added a goal after a 50 metre penalty, he would quickly play on and kick the running goal. Riordan was one of Country’s more impactful midfielders showing his class and composure around the ball and working hard to move the ball on and attack at any opportunity. He had a lovely kick inside 50 in the first quarter and showed some dash in the third quarter with a great run through the middle of the ground and kicking long inside 50. Serong was a really strong player through the midfield and Country’s obvious standout in the second game. His work through the midfield was first class with his clean and hard attack on the ball and his movement to avoid tacklers to get a handball out. Serong would kick a terrific long goal from 50 meters which showed his class and why he is considered one of Country’s better prospects for the 2019 season. Smith was solid down back doing well in one on ones and working hard to rebound ad move the ball forward. Smith played his role well down back doing everything required and showing strong leadership showing why he was named the Gippsland captain. Weightman did not get a lot of the ball but he always looked dangerous both in the air and at ground level constantly throwing himself up for marks and making defenders panic at ground level with his run and excitement, Weightman had his best quarter in the last with some very nice things around the ball. Wild was a solid player through the midfield, working hard inside and outside the contests to stay involved over the four quarters. He kicked a goal from a set shot after winning a free kick in the first quarter, and Wild showed his toughness with a hard tackle winning a free kick in the third quarter and then kicking wide with lovely delivery to his teammates advantage. Young started slow down back but really lifted in the second quarter with some great work under pressure and some good link-up play. He would work really hard for the rest of the game doing his best to win every contest he was near and run off to be an option and use his lethal left boot. Young was often used for kick outs where he was effective at hitting short and long passes with ease. Finished the game a bit sore after a ripping first half where he showed good hands under pressure, in one instance giving it off to Carafa in the third term to give him time and space. Kicked a goal in the same quarter after running into the hole and taking a mark uncontested then converting the set shot. Showed off his nice penetrating kick at times. The classy ball magnet was deployed off half-back and just used the ball so well. He was busy early and able to hit up targets with ease on his left. He showed great composure in traffic and got to the outside and had an impact. After a fumble or two early, Butler came into his own as the game went on, looking very impressive off half-back – running off his opponent to get forward and creative scoring opportunities for teammates. He had a terrific kick out in front of a leading Billy McCormack who capitalised with a goal, and had the ball on a string throughout the second half. An impressive performance. Was played on the outside most of the game, often playing off a wing. He used quick hands and showed nice speed out of a stoppage using his opposite foot to find a target inside 50. Was hit and miss by foot at times, but performed throughout the four quarters, setting up a few players inside 50 including neat kicks to Curtis Brown and Josh May in the second half. Just kept battling and giving his all throughout the game. The Sandringham Dragons forward shines as the clear standout key position forward from the Victorian perspective, with his leading patterns and work rate impressive. He pushes up the ground and finds the ball, and can double back and make second leads where required. He did have a set shot to forget missing the lot early, but capped it off with some goals including the easiest of attempts alone in the goal square and another from long range which bounced through. The half-forward had a number of strong chances, going in hard and providing plenty of defensive pressure, booting a goal for his efforts after protecting the ball drop inside 50 then putting it straight through the middle. One of the more memorable moments was spoiling a kick and nullifying a contest against three opponents. After a quiet start to the game, Jeka came into his own in the final term, booting three goals and hitting the post to almost single-handedly take the game away from Country. He showed good aggression going for his marks and took a couple of great contested grabs. Jeka showed a good presence and while he did go to ground a number of times, when marking took the ball at the highest point. Not a huge possession winner but took a number of good marks playing at half-back. Spread to dangerous positions and took a great intercept mark at centre-half back in the second half. The big disposal winner played a multitude of roles across the ground, winning the ball on the wing, in defence and even getting forward to kick a goal and set up another. He has neat skills and particularly stepped up in the second half, pushing hard along the wing to win a chain of possessions from the back pocket to forward pocket. Just keeps running all day. The energetic small was clean at ground level and moved well throughout the game. Mellis showed good composure and good vision and was able to use his hands on the inside with quick hands. Was solid throughout. A big game from the Calder Cannons midfielder who was second to Matt Rowell across the four quarters. He and Rowell combined well through the middle and he was able to capitalise on the outside using his slick skills to get the ball forward. He won his fair share of his own footy as well and was able to use quick hands to keep the ball moving. Mott also had a number of scoring assists and kicked a terrific goal in the final term off a step. Got better as the game went on and was strong in the back 50 showing composure coming off half-back and using his penetrating kick to clear defence. Was often mopping up throughout the back half and getting it cleanly to teammates. Peeled off when needed but was accountable at the same time. Going from strength to strength is the star midfielder. Hardly puts a foot wrong and is just a complete all-round player not dissimilar to Sam Walsh last year. Rowell took a number of strong marks around the ground, won plenty of the football and clearances, then capped off a stunning performance with a couple of goals. Kicked his first with a perfect kick on his left straight through the middle, then did it again later in the game where he seemingly cruised out of a stoppage and just put it straight through. No doubt suffered leather poisoning in a best on ground performance. Kicked a couple of goals throughout and had a crack, a quick snap through in the first half got him on the board then snuck inside 50, took an uncontested mark and kicked a good goal.